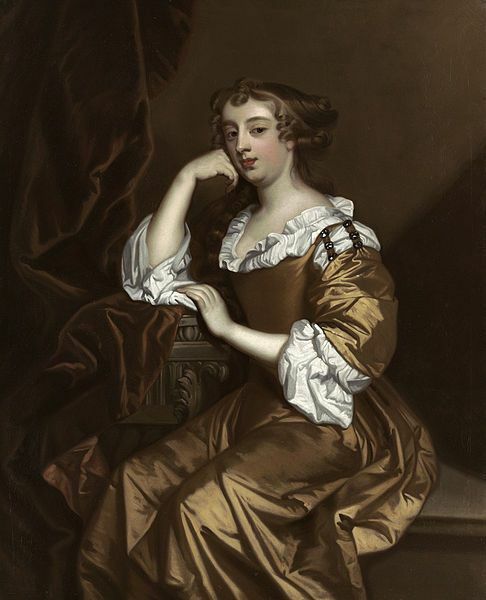 Although I finished my 1660s gown nicely on time in 2017, the outfit wasnt’t quite complete yet. Most importantly, I still needed a shift! 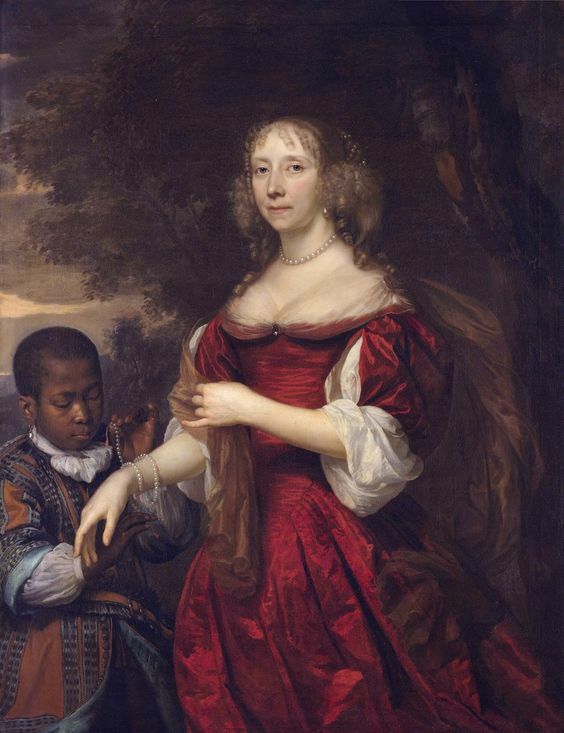 In many 1660’s portraits, you see large white ‘under’ sleeves beneath the bodice sleeves, which are (I suspect) usually the sleeves of the shift. Additionally, you often get a bit of white fabric above the neckline of the bodice. Again, probably usually the shift. Although you see many different styles, both in neckline and undersleeve, this was the look I was going for. So a large pouf with a ruffle beneath the sleeve, and a thin white band above the neckline. Just in comparison, some of the other styles I found. 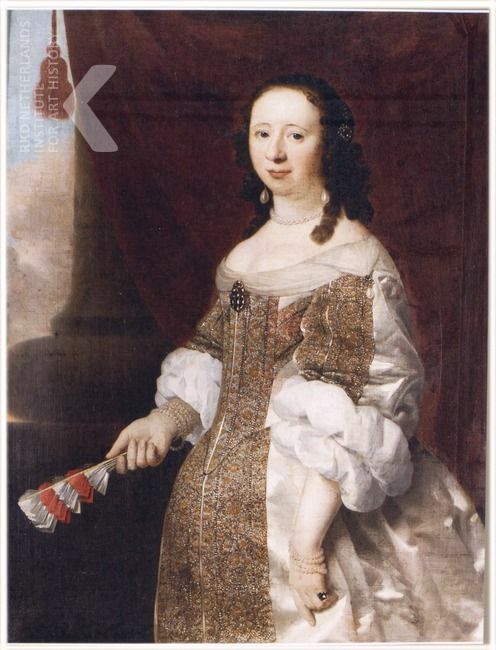 Many Dutch portraits show the more ‘modest’ (protestant?) look with narrow sleeve cuffs and/or a large lace collar. I might try my hand at these as well some time, but for the ball I wanted a more ‘evening’ look. You also sometimes see a clear ruffle above the neckline, instead of just a narrow band. Additionally, some sleeves seem to be gathered up and pinned, instead of having the ‘pouf’. You also see some sheer fabric in the necklines, which is different from the sleeves. I suspect these are separate and draped on top, although I’m by no means an expert. Basically the main conjecture for shifts seems to be: gathered neckline, with or without extra ruffle, and long wide sleeves, either pinned up or gathered into a pouf. The portraits showing ladies in their underwear seem to confirm this. 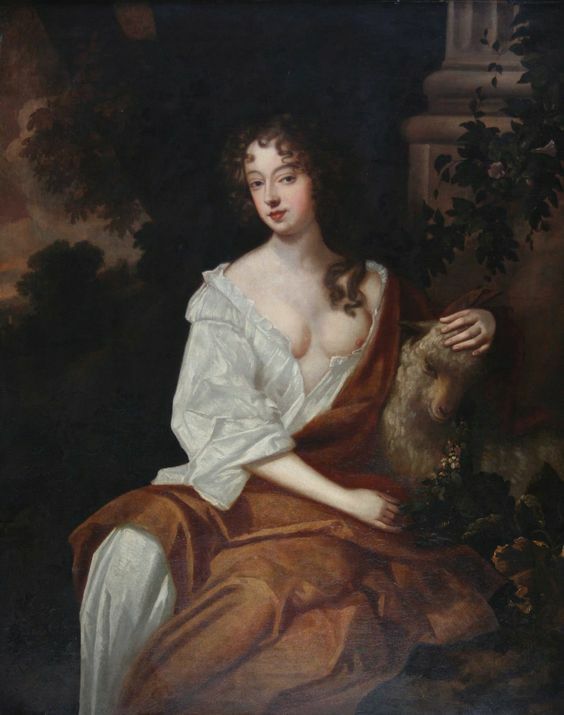 Two portraits of Nell Gwyn. The first shows the gathered strip at the neckline. This second one is just gathered at the top. In the end, I chose to base my shift on the one made by Before the Automobile. I liked her method of seamless gores, and it ticked also the boxes of having a pouf sleeve (although I made mine slightly longer) and a band at the neckline. I sort-of measured the neckline to get the width of the finished shift, and cut my pieces about 2x as wide to allow for gathering. The shift is about 1m long from the neckline down. The eventual pattern pieces about these sizes: Front: 75 wide, 100cm long. Back: 75 wide, 105cm long, Sleeves: 60 wide, 50 long, Gussets: 13×13, Gores: 70 wide at the bottom, length to fit with front & back. Before any gathering. The back is slightly higher than the front. I sewed most of the shift by machine as I wanted to finish it in a day. I might go back and hand-finish the seams from the inside. Some more pictures (apologies for the grainy quality, I won’t have any opportunities to take pictures with daylight for 2 weeks, so it was dark when I took these). The gathering on the neckline and sleeve. Left is the view from under the arm, from the side. The gusset is inserted into the gore, which is cut open, and then attached to the sleeve. And left is the finished shift! The 1660’s dress is done! Well, nearly done, because I’m skipping the lining of the bodice for now, as I also still need to make a shift, and the ball is in two weeks. First up, construction of the outer layer and the sleeves! (scroll to the end for pretty pictures). When I left off in the previous post, the foundation of the bodice was done. The silk outer layer is attached to the foundation piece by piece, by hand. It’s also not patterned the same as the outer layer, so the first thing I did was compare where the new seams would be on the foundation pieces, and draft the pattern on top of the foundation. A lot easier than adapting the pieces first time around, as I now had the foundation to start from! I also put a cotton layer between the foundation and the silk, to get some extra ‘padding’ to hide the boning. Cotton is not period, but I didn’t have linen thin enough laying around, and my goal was that all visible parts would look period, and you can’t see this layer anyway. The original bodice did not have a layer of interfacing like this everywhere, but did have paper in places. I’ve no clue what type of paper would be best, so I used cotton. Cutting the silk was terrifying by the way. The first piece that was attached was the side back piece. It was also the most difficult piece, as the foundation has a little gore between two of the tabs, yet the outer layer has not. The book described how the outer layer was basted in place first with pad stitches, before being stitched down, so I did that for this piece. Took time, but helps in getting it to lay flat. After the basting, it was stitched in place around the edges and around the tabs. Next up was the side front piece. For this one (and the others) I skipped the basting. Instead, I pinned the silk over the foundation while it was on my dummy, so it would follow the right curve. I kept most of the pins in while stitching the edges in place, which was a challenge as they were sticking out straight in the back. Yes, I pricked myself regularly. The edge next to the side back was cut to size (as I’d cut the pieces quite large), folded over and top stitched. For the front piece the process was slightly different. The sides were folded over first and stitched in place, before attaching it to the bodice. This is done because the lace is attached to the silk before being stitched to the bodice. I used antique metallic lace, a combination of netting and a scalloped lace. The cords are modern, but I wasn’t counting on getting lucky enough to also find golden metallic cord. The netting was stitched on first, two rows down the center and along the edges. After that the scallops came on, and finally the cord was stitched along the edges. I really love the depth of combining the lace like this. The front piece was then attached as a whole. The back piece was stitched on much like the others, seams folded back along the side back seam and top stitched. Center back it was turned around the edge and prick stitched in place so that the space for the eyelets was secure. I forgot to take pictures at this stage…. I did take pictures of making the eyelets though! I also calculated that these took about 10 hours in total. I spaced them quite closely, as I find that eyelets spaced too far apart really look too modern. It’s a bit of a pain to do so many. The top edges of the back of the bodice was finished by turning the silk in between itself and the foundation, and stitching it in place. Possible as the top of the foundation was already bound. The front wasn’t, so there the top was folded over to the inside and stitched in place there. The raw edges will eventually be covered by the lining. Then it was time to trim the back! Again I used a combination of netting, scallops and cord. This time it was stitched on through all layers. Final thing on the main bodice was to bind the tabs! The original used a silk ribbon, I chose just to use strips from the silk fabric. This was my first time binding tabs, and they’re not the prettiest thing, but as they’ll be worn inside the skirt I’m okay wit that. You can also see quite clearly which side I did first (left image). I did get better (right image)! Bodice done, right? Except the sleeves, which I’d put off slightly… I made a rough mock-up by making a cotton sleeve and fitting that, to see if I could use the original size sleeve without alterations. Turned out I was rather restricted in my movement, but that was wholly due to the strap being quite low on the shoulder, the sleeve was fine. The little sleeve-wings were made first, 2 layers of linen, covered in silk, covered in netting. The sleeves themselves are made of silk, with a cotton lining, and a layer of heavy linen partly covering the top. This linen mostly helps to fill out the cartridge pleats. The sleeves were trimmed with one side seam sewn. Inside stitch lines, also showing where the layer of linen stops. After that came stitching the other side seam, and then the cartridge pleating, and pleating and binding the bottom. After pleating, they were attached to the bodice. The shoulder wings I attached after I did the sleeves to get the placement right, and the finial step was to trim the bottom of the sleeve. Almost ready to be attached! Left is already pleated, right not yet. And now it’s done! This took so much hand sewing fiddling, pricking in my fingers etc. I’ts probably the most labour-intensive thing I’ve ever made, definitely the most structured. I learnt a lot making it though, and I’m really proud of how it turned out. The materials are gorgeous (still so happy with my metallic lace! ), and with the heavy boned interior I think it really gets the look of the period right. So, time for pretty pictures! I also love how the back came out. I’ve put the bodice over my new petticoat in these pictures. The skirt is also done, but deserves it’s own post (this one is getting way too long), so that’ll follow shortly! I’ve gotten quite a long way on my 1660’s dress, and the base of the bodice is nearing completion. Time for a blog post about the interior, as it’s quite interesting on it’s own! Although stays were already worn in the 17th century, the particular type of bodice I’m making does not need stays. Instead, the bodice itself is heavily boned to provide the support. I started making my bodice with the guidance of the book Seventeenth Century Women’s dress patterns. It shows close-ups, an x-ray picture (to see the boning), patterns and full construction notes for every original garment. I based my bodice on this one from the book. I made some changes to construction though, mostly because I machine-sewed the parts I could without it showing on the outside. I also didn’t always add every extra layer of linen. The original has loads of little extra pieces stitched in in places, and most of those I left out. While the outer layer was attached entirely by hand, the foundation is therefore not constructed in a historical accurate way, just as a disclaimer. First step was adapting the pattern. I’d scaled it up, but made it a bit too big, so had to take it in again. I also took away most of the bust curve in front as I didn’t need it, and I lowered the neckline. 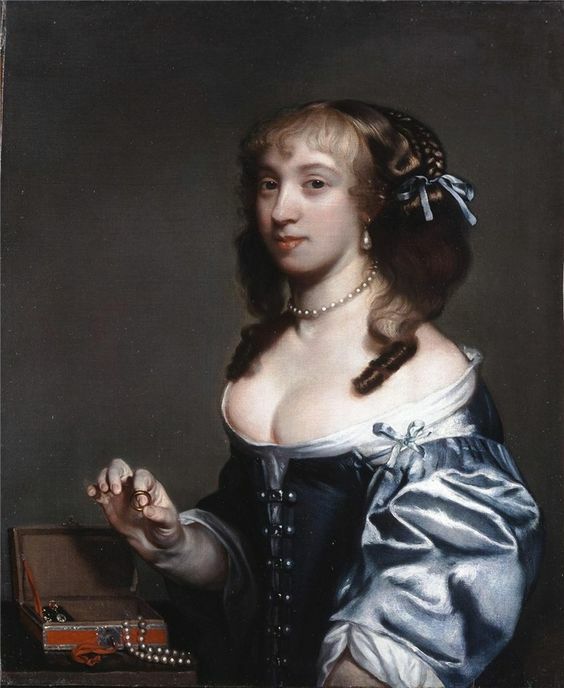 Many 17th century bodices are quite low, with maybe a shift on top to make them a bit more modest. Copying the pattern to cm grid so I could scale up to my full size cm gridded pattern paper. Not necessarily too modest though. Being rather small on top, that means I could cut it lower than the original. I also changed the angle of the straps slightly so they would still lay over the shoulder okay. 2nd mock-up. With a busk for fitting purposes. After fitting, it was time to start the sewing! I used sturdy linen for the foundation. Every piece has 2 layers of linen. First step was drawing the boning channels on top, trying to follow both the original lines and accounting for different pattern shapes and bone width. Sewing the boning channels took some time, even by machine. I respect those who do this by hand. One piece in the original is unboned, and instead stiffened by extra layers of linen buckram and wool. I used coutil because I didn’t have buckram (I know cotton coutil isn’t period), and some leftover wool from another project. Those layers were pad-stitched together for extra support. After that, I sewed all pieces together, again by machine. The trickiest part was a little gusset added between two of the tabs, for a little extra flare. It worked quite well on the body! It’s just sewn in by laying it next to the foundation and sewing it together. Both sides will be covered anyway, by lining or outer layer. After that I put the boning in, I could still reach most places after construction. The only construction done after the boning was the strap, as that closes off the channels. I used 5mm wide German synthethic whalebone for this project. I’d gotten a 25m roll, and after my 1880’s corset and this bodice I had 2cm left over… Suffice to say you need a lot of meters for continuous boning like this! German plastic baleen as boning. The foundation layer also has a pocket for the busk. 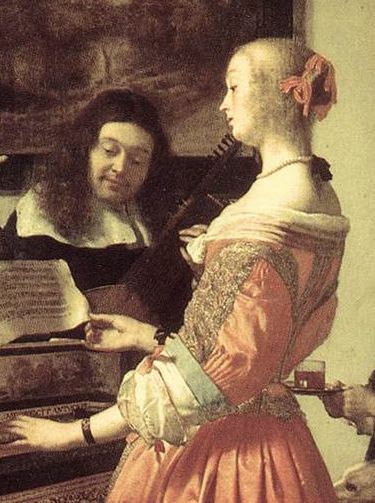 This was gone in the original, but is there in most other examples of such bodices. It’s basically a strip of linen sewn to the inside, and a pocket at the tip. Insides. All seams are stitched down, necessary because the linen is so thick it doesn’t lay nicely flat otherwise. The final step of the foundation was to bind the bottom of the front panels, and the top of the back panels. These are the places where the allowance of outer layer will be turned in between the layers and sewn down. (The bottom of the back panels will be bound all layers together, the top of the front will be finished by turning the allowance of the outer layer to the inside around the linen. That finished the foundation! It already looks really great, the most annoying thing at this point was not being able to try it on yet. The eyelets are sewn through the outer layer as well, so no way to close it yet until those layers are on and all eyelets are in. At the moment I’ve only got a little bit of trimming and sleeves to do, so when those are done I’ll show the bodice with the golden silk and trim on top! Those who follow my instagram account might have already seen that I’m currently working on a gown from ca. 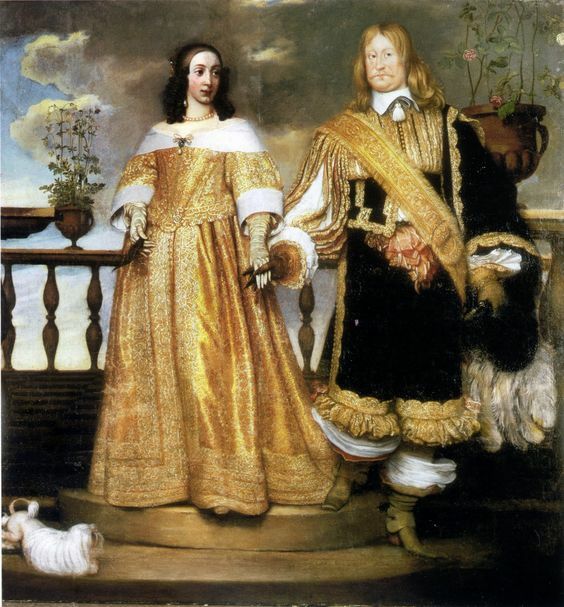 1660. This project started with a ball. There’s a yearly new-years ball in Gent, in the opera there. I’ve been wanting to go for a while but timing has been off (I was on holiday last year). This year I was talking with another costumer about it and we decided to go! Last years theme was 19th century, but this year it’s going back in time. 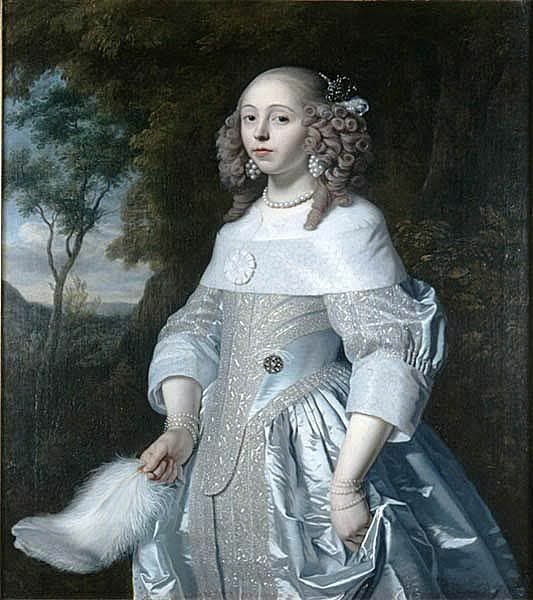 Inspired by Versailles, the dress code is now 1660 – 1715. So that means I need a new dress! 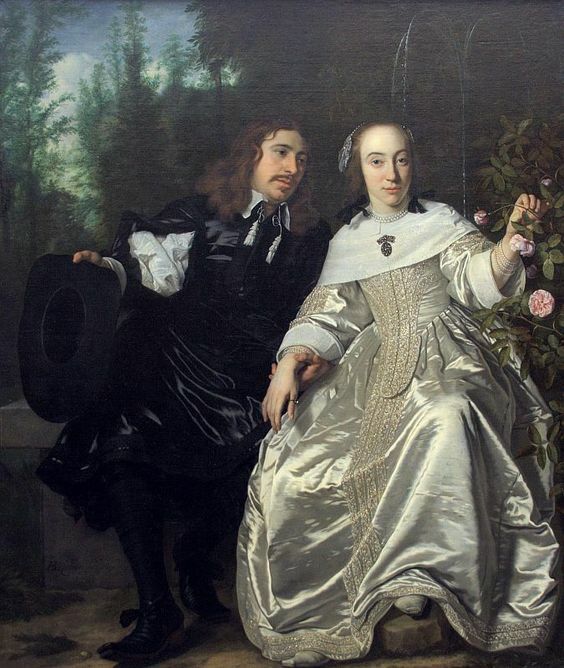 I’ve decided to go for the early limit of the dress code, as I’d been looking at 1660’s fashions for a bit longer and those are best represented in research as well. As often happens, I started with looking for fabric. I wanted real silk, but keeping it affordable means searching for bargains and that often means picking from whatever happens to be available. I got really lucky with fabric, and found a golden upholstery silk with a pattern quite suitable for the era. When I got it the color was absolutely stunning. It’s a bit of an ‘older’, antique golden color. What’s even better, it goes perfectly with the antique metallic lace I found a little while back. The materials decide the style in this case, and I decided to go for a style that would fit with lace trimming. 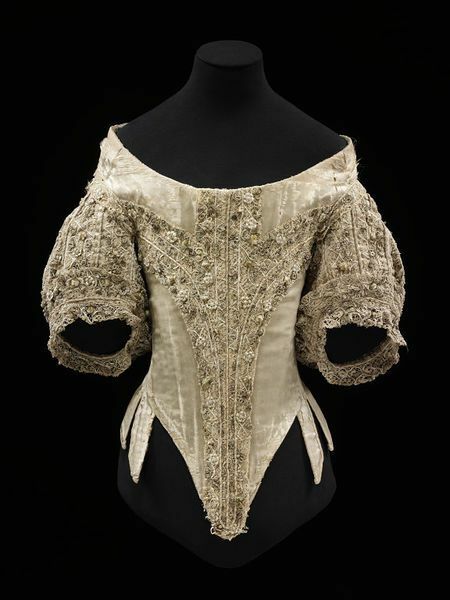 Lucky for me, many of the existent 1660’s bodices have lace trim and work very well with my materials. 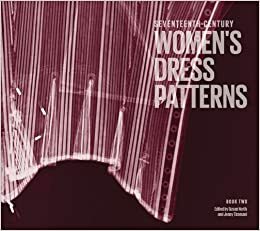 To help with the patterning and construction I also got a new book, seventeenth century women’s dress patterns (part II). It’s absolutely brilliant, showing close up pictures of both inside and outside the garments, x-rays that show the boning, patterns for both exterior and foundation layers and full construction notes. So that’s the base for my pattern. The skirt will be a pleated rectangle, so doable without any patterning. For the rest of this post: some more pictures of what I’m going for, as inspiration! 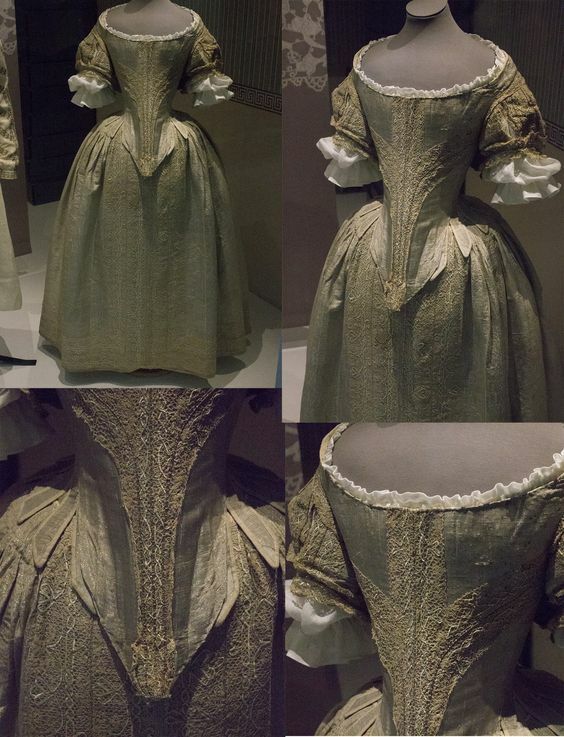 One other dress in this style is the silver tissue gown I saw in Bath last year. So stunning in person. I love this painting as well, as it shows the combination of patterned gold silk with lace. 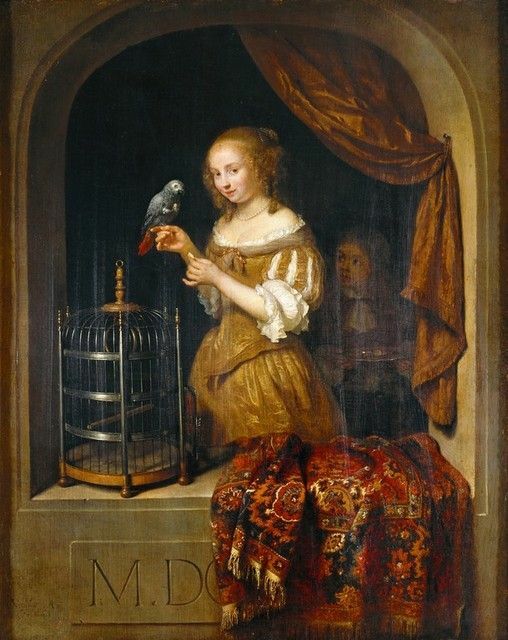 It’s a style you see quite a lot in Dutch paintings. 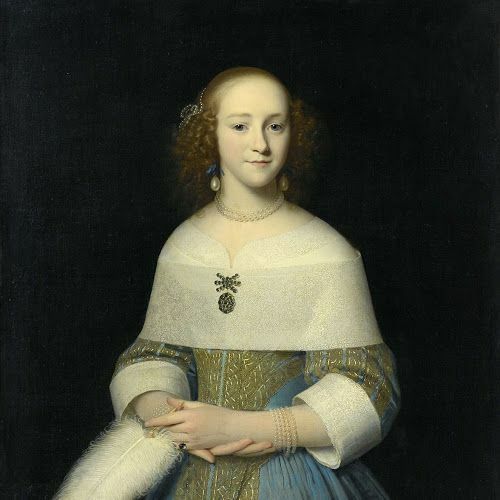 You do get quite some differences between countries the further back you go in history, and I like the idea of making something that could’ve been worn in the Netherlands. All of the above show thin linen or lace collars, but you also see what’s more like a thin linen shift above the dress. This is probably what I’ll go for as well for the ball, as it feels a bit more like evening wear. At this point I’m done with the foundation layer of linen and boning, and ready to start patterning the top silk layer!